Validate Scope on the PMP Certification Exam means that you’re receiving formal acceptance of project deliverables. The project charter identifies who can sign off that the project is complete. The project scope statement identifies criteria for completion. Validate Scope. Formalizing acceptance of the completed project deliverables. Another area where you could have trouble if you don’t know the glossary terms is understanding the difference between validation and verification. These two terms can be used interchangeably or in very specific ways, depending on the industry in which you work. The PMP exam will say that verification means the product complies with requirements. Validation means the product meets the needs of the customer. Verification. The evaluation of whether a product, service, or system complies with a regulation, requirement, specification, or imposed condition. It is often an internal process. Validation. The assurance that a product, service, or system meets the needs of the customer and other identified stakeholders. It often involves acceptance and suitability with external customers. Here is one other little nuance you should know about validating scope before you get into the meat of the process: Validate Scope and Control Quality are closely related. The difference is that the intent of Control Quality is to ensure that the deliverables are technically correct. The intent of Validate Scope is to obtain customer acceptance. This means that theoretically, you could have a deliverable that’s not correct and doesn’t pass quality control but might be accepted by the customer. The customer might waive a requirement or say the deliverable is good enough — or perhaps it isn’t correct because you over-delivered. In all these situations, the deliverable is not correct, but it would be accepted. In general, the Control Quality process is performed prior to validating scope. 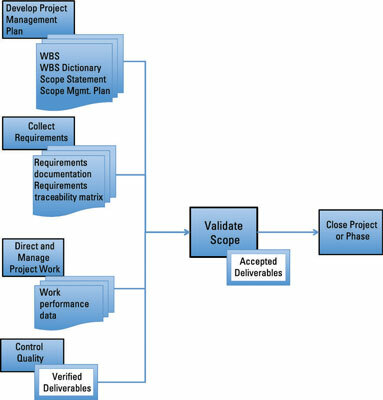 You can see how components from the project management plan and the Collect Requirements process are used along with the deliverables created from the Direct and Manage Project Work process that have been are verified in the Control Quality process. Those verified deliverables are ready for inspection in the Validate Scope process. After the deliverables are accepted, they are ready for close-out. This is a good opportunity to stress an important point about the relationship between getting acceptance on the deliverables and closing the project or phase: You should perform scope validation throughout the project. You don’t want to wait until the end of the project to show everything to the customer and hope that he likes it. You need to show deliverables along the way. The Close Project or Phase process occurs at the end of a phase when the customer accepts an entire set of deliverables and formally signs off that the phase is complete — or, in the case of the project, signs off that all deliverables are complete and accepted, and then the project can move into project closure.